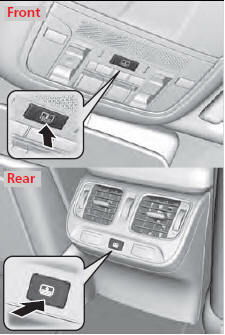 The power rear sunshade can be operated with the power mode in ON. To raise: Press the button. To lower: Press the button again. If the sunshade stops while moving, check for and clear any obstacles, then push the button again. Opening or closing the sunshade on someone’s hands or fingers can cause serious injury. Make sure all hands and fingers are clear of the sunshade before opening or closing it.